The CBI community joins the rest of the Jewish world, and those of all faiths who honor the image of God in every human being, in mourning the deaths of Eyal Yifrach, Naftali Fraenkel and Gilad Shaar. We hold their grieving families in our hearts. We know that we can barely begin to imagine what they are going through. May they be upheld by the loving support of their community at this terrible time. A memorial service is being planned for Wednesday evening at 7:30pm at Congregation Ahavath Sholom, 15 North Street, Great Barrington. May the Source of Peace bring comfort to their families, and to all who mourn. Baruch dayan ha-emet. Shavua tov / a good week to you! This week we’re reading the Torah portion called Balak in the book of Numbers. The name of the Torah portion is a hyperlink; click on it to be taken to the Torah portion in English if you want to read the portion before coming to Shabbat services. This Shabbat, our shaliach tzibbur (prayer leader) for morning services (July 5) will be Rabbi Rachel. We extend a hearty thank you in advance to this week’s service host, Rabbi Pam Wax, and also to everyone who is bringing a vegetarian / dairy dish to our brunch after Shabbat morning services honoring the Ranzers. If you would like to join the shamashim (“helpers”) who welcome people to our Shabbat services and who host our light kiddush afterwards, contact Pattie Lipman. Shavua tov / a good week to you! This week we’re reading the Torah portion called Chukat in the book of Numbers. The name of the Torah portion is a hyperlink; click on it to be taken to the Torah portion in English if you want to read the portion before coming to Shabbat services. This Shabbat, our shaliach tzibbur (prayer leader) for morning services (June 28th) will be Rabbi Pam Wax. We extend a hearty thank you in advance to this week’s service host, Wendy Penner. If you would like to join the shamashim (“helpers”) who welcome people to our Shabbat services and who host our light kiddush afterwards, contact Pattie Lipman. 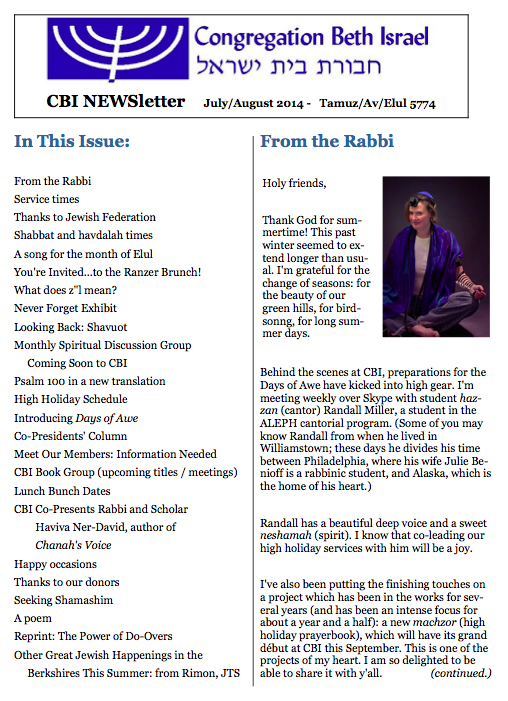 The CBI July-August Newsletter is here! From the Rabbi, Service times, Thanks to Jewish Federation, Shabbat and havdalah times, A song for the month of Elul, You’re Invited…to the Ranzer Brunch!, What does z”l mean?, Never Forget Exhibit , Looking Back: Shavuot, Monthly Spiritual Discussion Group Coming Soon to CBI, Psalm 100 in a new translation, High Holiday Schedule , Introducing Days of Awe, Co-Presidents’ Column , Meet Our Members: Information Needed, CBI Book Group (upcoming titles / meetings) , Lunch Bunch Dates, CBI Co-Presents Rabbi and Scholar Haviva Ner-David, author of Chanah’s Voice, Happy occasions, Thanks to our donors, Seeking Shamashim, A poem, Reprint: The Power of Do-Overs,and Other Great Jewish Happenings in the Berkshires This Summer: from Rimon and JTS. 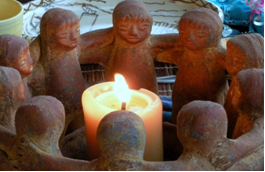 Starting in late June, a spiritual discussion group will meet at CBI, once a month, on a Friday afternoon at 3pm. This group is growing out of the weekly spiritual discussion group which took place at CBI during the Counting of the Omer, but is not limited to those who participated in that group. All are welcome to join! Unlike the Omer group, which functioned on a drop-in basis, this is envisioned as a group of people who are interested in meeting regularly together to talk about spiritual life and to do some learning. We ask that participants sign up in advance, so that over the course of the year we can build closer relationships and rapport among the participants, which will in turn deepen our conversations. At each meeting we’ll explore a text together — perhaps part of the Torah portion, to see how and whether it speaks to our own spiritual journeys; perhaps a Hasidic or Kabbalistic (mystical) text about an upcoming holiday; perhaps a Mussar (ethical self-improvement) text — and we’ll also talk about our spiritual lives as they continue to unfold. No previous experience with any Jewish subject matter is required. Each date is a Friday; we’ll meet at CBI at 3pm in my office. I know that we all have busy lives and that any individual participant may not be able to make it to every session; that’s okay! If this is something in which you are interested, please sign up by June 25 so I know how many copies to prepare for our first meeting. We’ve come down from the mountain: Shavuot is past, and now our task is to integrate whatever revelation we’ve received and to weave it into the fabric of our daily lives. As Reb Shlomo writes, “The whole wide world is waiting to sing a song of Shabbat” — join us in singing. This Shabbat we’ll mark the 70th anniversary of D-Day at CBI with a moment of silence to remember the Jewish soldiers who gave their lives at Normandy. In this week’s Torah portion we’ll read the story which gives rise to Moses’ fervent prayer of healing: “Please, God, please heal her!” May our prayers for healing reach those who mourn the losses sustained on D-Day, and all those in need of healing everywhere. Shavuot is almost upon us! Tomorrow (Tuesday) night we’ll convene at 8pm at the Williams College Jewish Religious Center for a short-and-sweet festival evening service followed by an evening / night of amazing learning together with Congregation Beth El (Bennington) community and a few folks from Williams College. We have an amazing line-up of teachings on a wide variety of subjects — the list is enclosed, and I hope it will entice you to join us. 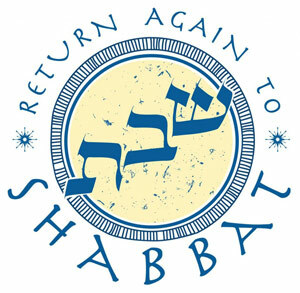 On Wednesday morning we’ll convene again at CBI at 10am for a festival morning service led by Rabbi Pam Wax, which will include Yizkor, our quarterly opportunity to connect with the memories of those whom we love who have died. There will also be cheesecake! Jewish tradition holds that we were all present at Sinai when Torah was revealed — and that Torah continues to be revealed in our lives even now. May our Shavuot celebration open our hearts to the revelation we each most need. I look forward to seeing y’all at Sinai! Chaim Bronstein: Distribution of land in Torah: is it relevant to today’s wealth disparity? Anne Hartheimer: a short play based on a story by Agnon (“The Sign”) which takes place on Shavuot; we’ll read it aloud. Rabbi Jarah Greenfield: You’ll Eat Your Words, Prophet!